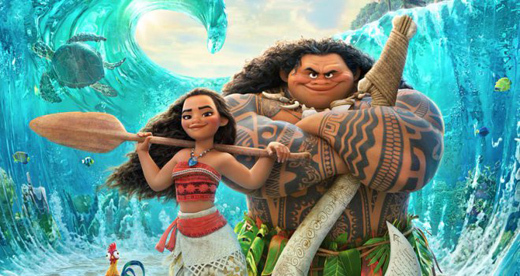 Dwayne “The Rock” Johnson and newcomer Auli’i Cravalho headline Disney’s latest animated feature, Moana, one of the year’s most original and charming films. I have to admit that I did not grow up a fan of the classic Disney animated films of the 1980’s and 1990’s. Films like Aladdin, Beauty and the Beast, and The Little Mermaid always felt to me as if they were meant to speak more to the fans of the Disney princess studio formula who would buy merchandise for the film sight unseen and had their VHS or DVD copy preordered from Toys ‘R Us. By the time that Pixar films began to reinvent what audiences knew as a Disney feature, I had moved on beyond keeping up with what new releases the erstwhile “House of Mouse” has up their sleeve for the summer or winter. It wasn’t really until films like Wreck-It Ralph, Up, and Big Hero 6 that I really became excited about what the latest Disney feature hitting theaters was all about. These films have really taken to deconstructing our traditional ideas regarding their respective archetypes but still manage to tell endearing, clever and rewatchable stories for children and adults. Moana falls squarely in this new Disney tradition; providing an intensely likeable and relatable heroine outside of the traditional Disney Princess mold. Moana, as voiced by 16 year old Auli’i Cravalho, is the heir to the chiefdom of the fictional Pacific island of Monatui. Her father, Chief Tui (voiced by Māori actor and Star Wars mainstay Temeura Morrison), is an extremely loving but overprotective figure in Moana’s life; one who is determined to see her become a great leader, but at the same time, curtail her infatuation with the sea. As the viewer learns early in the film, Moana is chosen by the ocean to reclaim the heart of Te Fiti, an anthropomorphic island goddess whose heart houses the power of creation. The demigod Maui (voiced by Dwayne “The Rock” Johnson) captured her heart to give to humanity as a gift; but his actions caused darkness to sweep over creation and the monstrous Te Kā exiles Maui as the heart sinks to the bottom of the ocean. Moana’s grandmother encourages her to follow the ocean’s wishes; especially as she finds their island home is succumbing to the darkness and that her people were once sea-faring explorers. Her journey then becomes one not just to find her place in the world, but also to remind her people who they are. One of the main reasons Moana just works is because the film is about journey. The movie actively subverts the Disney princess formula. Gender doesn’t play a role in the movie, Moana is presented as a strong and capable figure from the get-go. Her interactions with Maui, voiced as a well-intentioned but arrogant braggart by Johnson, are based on showing him she is just as much of an important figure as he believes himself to be. 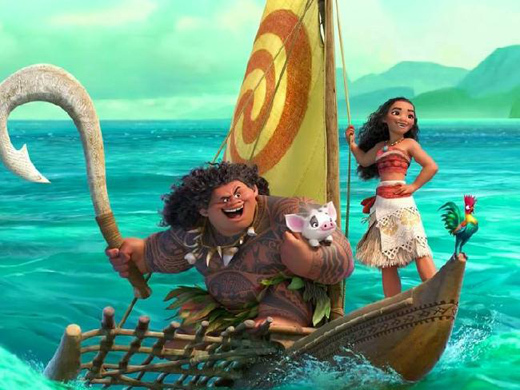 Maui, and The Rock’s effortless charisma in his voice acting, are a big surprise in the film. With Johnson’s voiceover work, and some infectiously catchy songs by Hamilton’s Lin Manuel-Noriega, he is very similar to the classic Hercules with Moana as his equal and cheerleader. The film is more of a hero’s journey of discovery, lacking a traditional Disney villain. Jemaine Clement plays the most stereotypical villain in the piece; a treasure hoarding hermit crab named Tamatoa (and yes we do get a song number from the Flight of the Conchords star). But by making this film one of self discovery versus one hitting tropes off the checklist, it’s a much stronger film that feels more like a traditional musical or play than standard animated fare. Moana is one of the year’s best; not just as an animated film, but as a great piece of filmmaking you should make it a point to seek out. This movie already started high marks because it didn’t feel it necessary to find screentime for a love story, which almost always becomes the prime motivator for the protagonist which a) gets tiresome and b) isn’t relatable for everyone. I really liked that about this movie too. Its nice to see the main character treated as just a person rather than a gender for a change and the fact that they didnt wedge in a creepy love sptry between Maui and Moana was an extra checkmark in my book. Apparently, Taika Waititi wrote the very first draft of this movie and gender was a big part of it and Moana was the runt girl in a family of 6 brothers but the directors agreed they didnt want to go that route to their benefit. I think this is another reason why I like Big Hero 6 – whose directors co-directed this film, people are peopel – not a love interest waiting to happen. Also a reason why I like Pacific Rim as well.